Kevin Muscat says the rules aren’t always being enforced by referees. 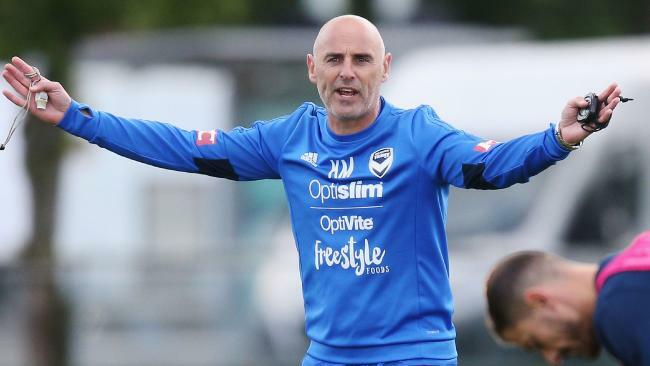 KEVIN Muscat says players "are confused and don't know where they stand" with referees as he launched a scathing critique on the consistency of A-League officiating. 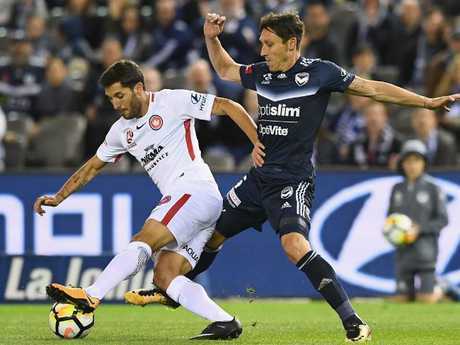 And the Melbourne Victory coach says his players don't have a discipline problem despite copping five yellow cards in a first half that saw Mitch Austin sent off and former captain Mark Milligan flirt with the same result in a controversial 1-1 draw with Western Sydney on Monday night. Meanwhile, league bosses have another video refereeing saga to deal with after a delay of over a couple of minutes preceded Oriol Riera's missed spot kick just before halftime that would have sent the Wanderers 2-0 up, with Hayden Foxe labelling the lag time "ridiculous". Austin's third minute yellow card was for a tackle from behind on Brendan Hamill, while the second 21 minutes later was for sticking his foot out to block a quickly taken free kick. Asked for his thoughts on the decision to give the winger his marching orders, Muscat went on a diatribe about refereeing consistency - even though he said Peter Green officiated "to the letter of the law". 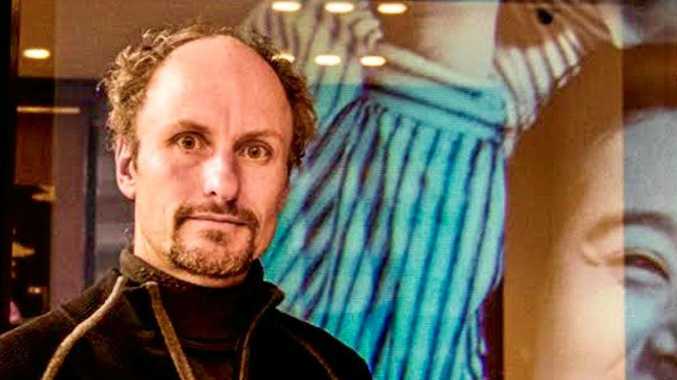 "I just want the rules to be the same for everyone every week," Muscat said. "I'm not defending Mitch, because after the booking you run the risk there if you stick your leg out. "But in every other game you can take the throw in from five or 10 yards further up the park (yet on Monday) it's got to be from where the ball goes out. "If he doesn't send (Austin) off there (it would be said) 'I've used my discretion', if he does (it's said) 'they're the rules'. "So, if they're the rules, just apply them every time. "The players don't know where they stand because of the difference in refereeing from one week to another. Mark Milligan had a robust game against the Wanderers. "Because, again, if we want to play the game to the letter of the law, the amount of free kicks that were taken whilst the ball was rolling (was a lot). "I might be picking here, but if you want to play by the rules we've got to play by them all the time. "There's also a rule that the goalkeeper can only keep the ball in his hands for six seconds, but they use their discretion on that one. "It's just my opinion on a range of matters. Are we playing by the rules, or just occasionally? "If you haven't got a free kick and you delay the restart by holding the ball it's a yellow card, but (on Monday against Leroy George it) was the first time I've seen it all season." Milligan crunched Hamill in the 37th minute and was given a yellow, but also swore at Green as he received his card, which often is a booking in its own right. His studs up challenge on Jumpei Kusukami in first half injury time was deemed to be a foul, but luckily for him did not warrant - in Green's eyes - another yellow. But Muscat said: "I didn't think he was in danger of getting a second yellow, no." 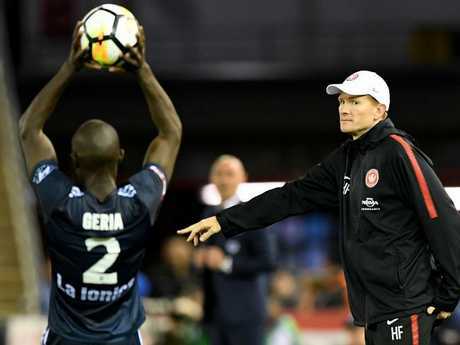 Caretaker coach Foxe, who now hands the reigns to Josep Gombau, did not use the VAR delay as an excuse for Riera's miss. Hayden Foxe was critical of the VAR delay when his side had a penalty. But the former Socceroos defender voiced the opinion of many when he said the system needs tidying up. The penalty - for Rhys Williams clumsily collecting Jumpei Kusukami with an outstretched leg - was given, but for reasons that remain unclear Riera was then made to endure a lengthy wait before Green then signalled that a review was taking place. "We're trying to improve the game and improve the decisions, so from that aspect, if it helps make the right decisions ... then it's great," Foxe said. "But, again, it takes a long time. Three minutes? Three minutes to restart, come on. "They've got to sort that out. It's ridiculous. It's happening week in, week out. "Everyone gets frustrated, but we've got to move on." Put to him that the delay helped his side's cause, Muscat said the penalty shouldn't have been given in the first place. "We would have got an advantage if the VAR ruled that he would have got nowhere near the ball," Muscat said. "Jumpei's a clever player, cuts inside, Rhys is actually pulling his leg away, realises he can't get to the ball. "Does he encourage the contact? Was there contact? I thought it was very soft. "I'm not saying because you can't get to the ball that you can just take someone's legs from beneath them, but was there seriously enough contact, when you're not going to get to the ball, to award a penalty?"